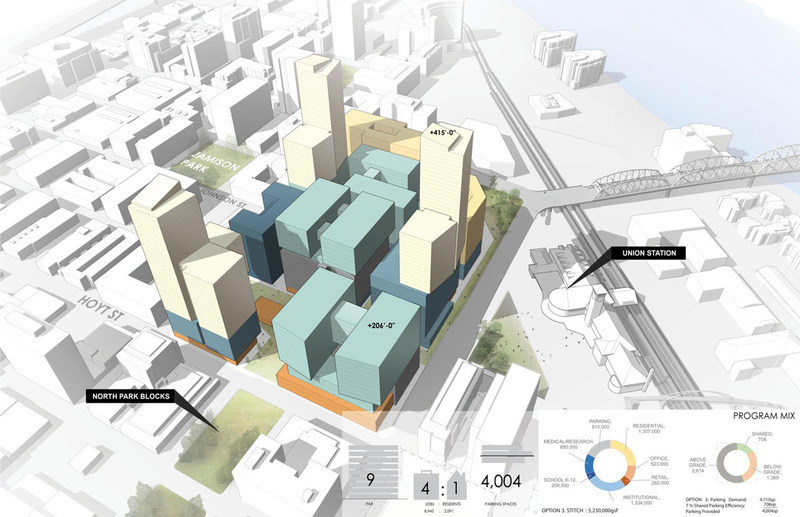 The first conceptual images of what a redevelopment of the USPS site in the Pearl might look like have been released by ZGF Architects and Skidmore, Owings & Merrill. 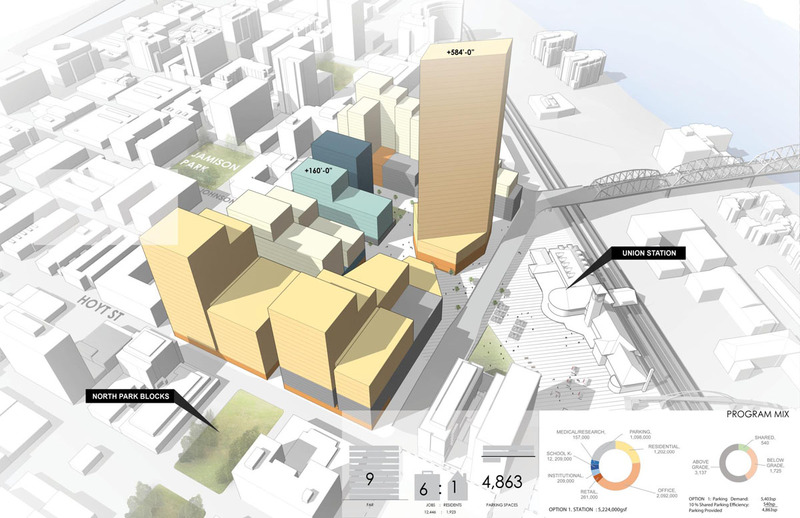 The images were prepared as part of the ongoing Broadway Corridor Framework Plan, a Portland Development Commission led effort to create a preferred development concept for the Post Office site. 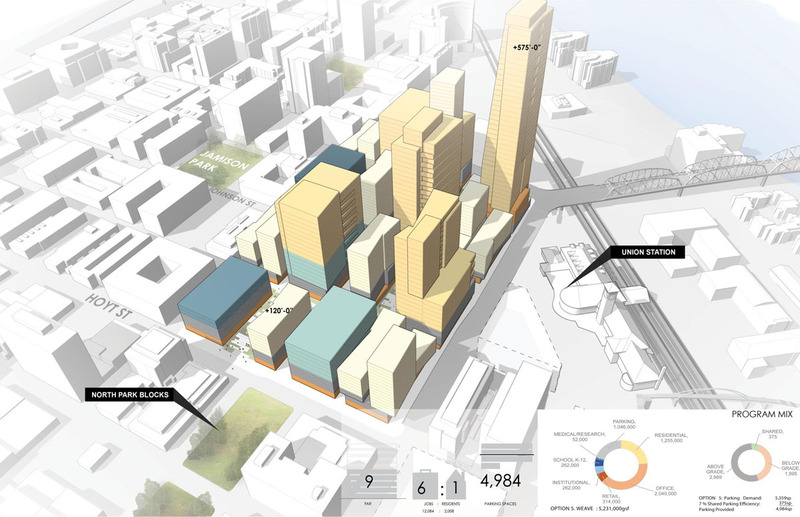 The PDC is currently in active negotiations to acquire the 14 acre Pearl District site, though none of the concepts represents a firm development proposal at this time. Five concepts were presented at an open house held on July 21st at PNCA. All of the concepts assume that the site would be developed with a mix of uses, but the proportions of different uses varies between the concepts. Similarly the Green Loop is addressed in all of the concepts, but the route it might take differs. 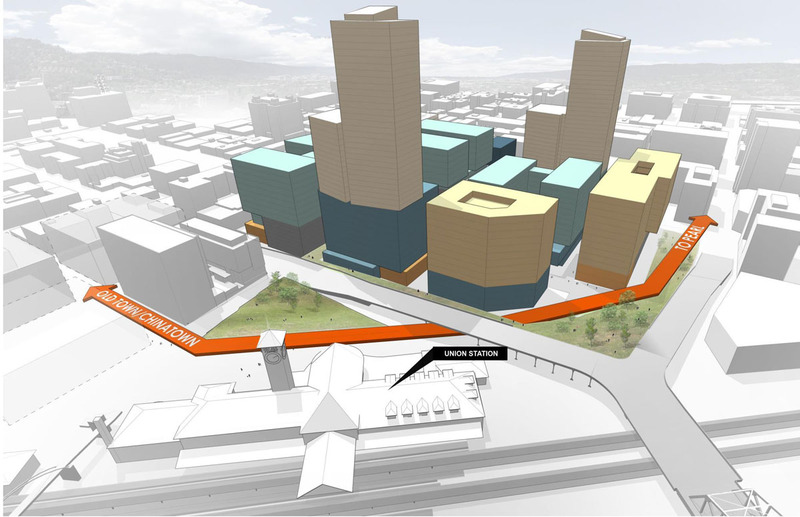 The ‘Cascade’ concept takes it is name from the gradual step down from the “Y” of the Broadway Bridge approaches, which could be built on the roof of a district parking structure. 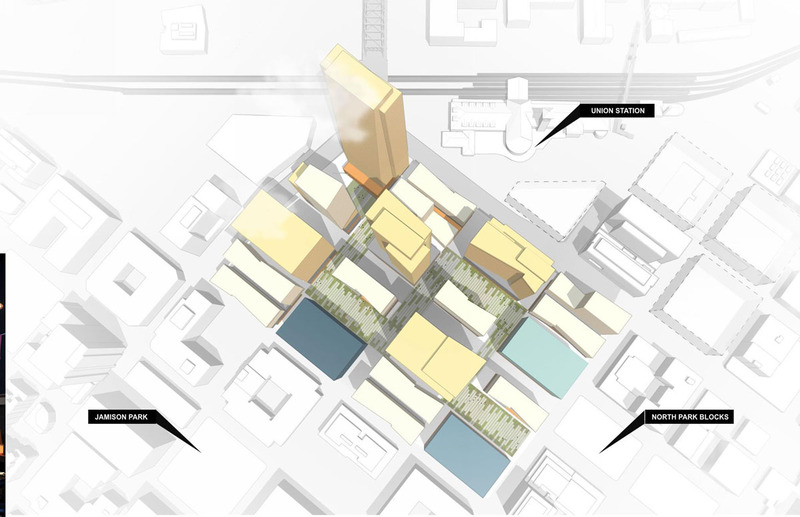 The concept extends the North Parks Blocks through the center of the site, and terminates the axis of the Park Blocks in a new high rise building. The ‘Station’ concept emphasis the axial relationship of the Union Station clock tower to NW Johnson St, which is currently interrupted by the Post Office building. A new plaza could be created in front of the historic station. In this concept the Green Loop is assumed to pass around the site. Johnson and Park would be open to cars, while the rest of the space would be for pedestrians only. 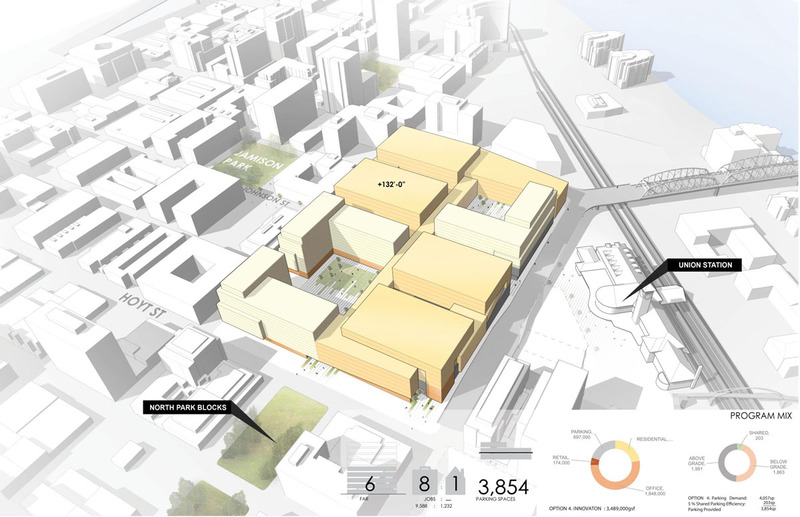 ‘Innovation’ is based on meeting the needs of large employer looking for office floor plates larger than can be built on Portland’s typical 200′ x 200′ blocks. A series of low rise buildings would be arranged around framed courtyards. While the ground level would remain permeable for pedestrians, the buildings might bridge over the right-of-way at the upper floors. The Green Loop would pass both through and around the campus. 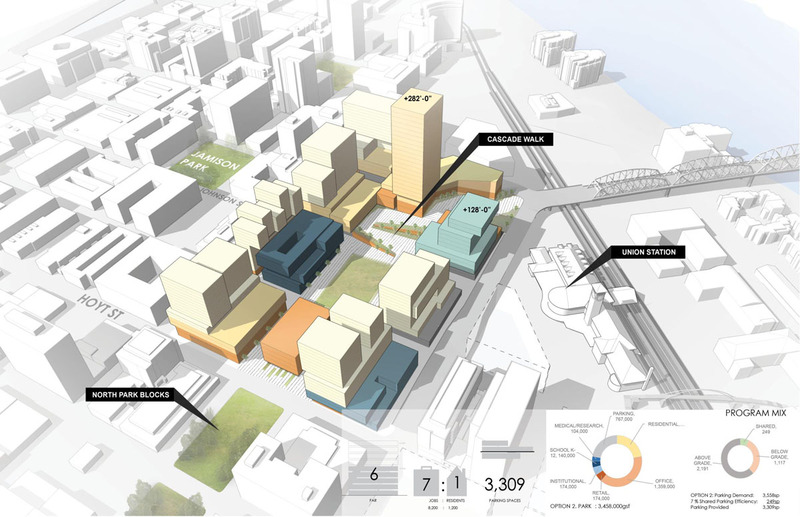 The ‘Stitch’ concept assumes a mix of medium rise buildings interspersed with high rise point towers. 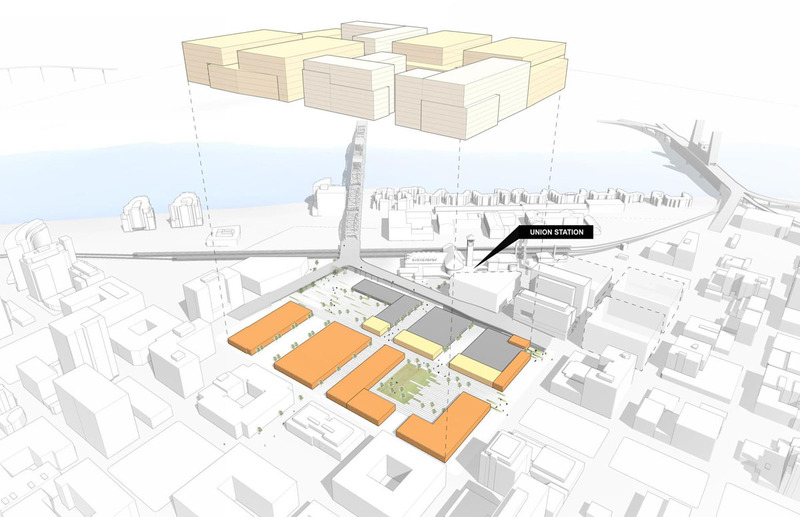 The arrangement of the buildings is designed to connect the site to both the Pearl District and Old Town, with the potential to showcase water throughout the site. A park could be created on the triangular block in front of Union Station. Johnson, Irving and Park would all be open to vehicular traffic, and the Green Loop would pass around the site. The ‘Weave’ concept has a series of wandering paths as its open space, and is designed to emphasize porosity and connectivity. By bring people on foot through the site on a number of different routes there would be an opportunity to enhance the Broadway bridge streetscape, and animate the spaces under the approach ramps. The Green Loop would pass through the center of the site in the ‘Weave’ concept. A signature tower is shown at bridge ‘Y’, which could mark the entry to the site. The five concepts are expected to be refined into a preferred concept over the course of the next couple months, with a preliminary estimate of the public cost produced. A third open house is currently scheduled for September. The final Broadway Corridor Framework Plan is expected to be presented to the PDC Board and the City Council in October. This entry was posted in Broadway Corridor, Old Town China Town, Pearl, Skidmore Owings & Merrill, ZGF Architects. Bookmark the permalink. I like the concepts. But has PDC made any progress in actually purchasing the land? Haven’t they been trying to buy the post office for decades? I understand that Portland’s blocks are small, but the whole Pearl District was built with, if not vehicular streets, at least walking streets, continuing the 260 x 260 grid in both directions. “Cascade” and “weave” come the closest to doing that, but even then, neither of them continues the North Park Blocks . “Stitch” at least makes a gesture acknowledging their existence. Irving intersects with Broadway a bit above grade, but that could be dealt with by ramping up on the west side as well, and that pedestrian connection made through the site. “Station” shows an elegant way to connect Johnson under the bridge ramp through the site, and focus travel to Union Station. It’s surprising to see the banned-in-Portland “skybridges” pop up in “Innovation”. Isn’t there a reason they’re not allowed in downtown? Cascade looks great, save for that one little building disrupting the continuation of the Park Blocks. 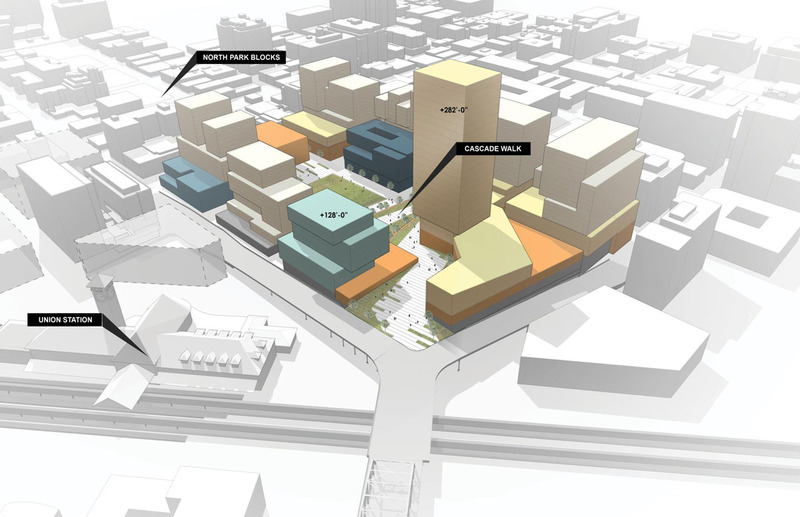 Distribute that floor space throughout the rest of the district and actually continue the Park Blocks. 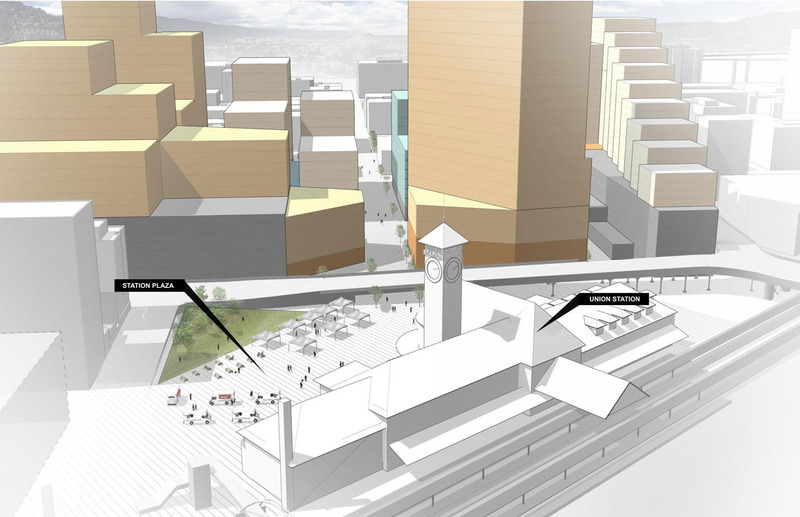 I like te connection with Union Station in the Station concept but would like to see a connection from that plaza through to the park blocks and to Jamison square. The taller towers in Station and cascade are a nice way to break up the stubby skyline and allow for more open space between buildings.